There’s nothing like the sweet, juicy flesh of a freshly ripe fig straight off the tree. 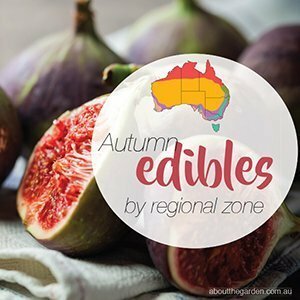 A highly ornamental tree in both formal and informal gardens, the fig can be grown in most parts of Australia. 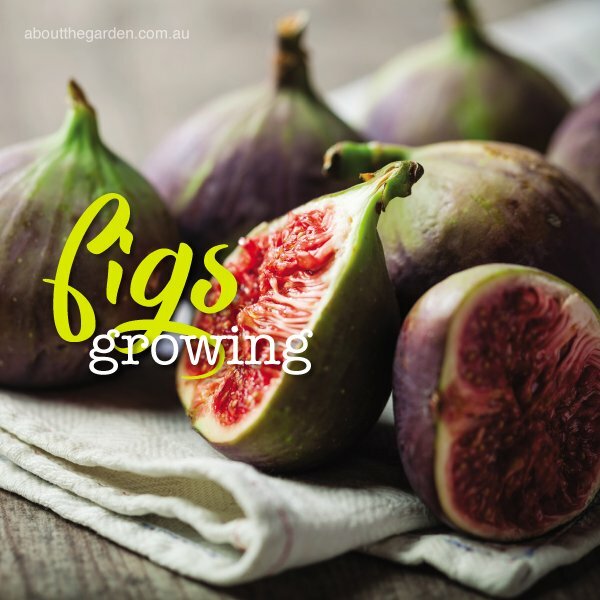 An excellent source of dietary fibre, calcium and a range of other nutrients, the fig is an easy and abundant cropper, making it one of the most rewarding trees to grow in home gardens. 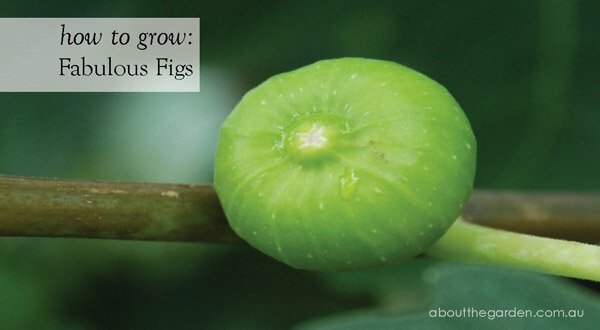 The common fig (Ficus carica) is a deciduous, large shrub or small tree, typically growing to a height of 3 or 4 metres. It originates from south-west Asia and is believed to have been distributed by humans through the Mediterranean from Afghanistan to Portugal in ancient times. Neolithic subfossils of figs which date back to between 9200 and 9400 BC suggest it was the first food crop ever cultivated by humans. 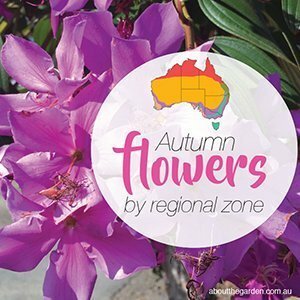 Fig trees love a hot, fairly dry climate so are ideal for most parts of Australia, where they can be planted at any time of year. They need full sun but dislike strong winds, so choose a sheltered position if this is an issue in your area. Although they grow happily in alkaline soils, they especially enjoy a compost-rich, slightly acidic soil, so don’t hesitate to dig plenty of Searles 5IN1 Plus into the soil before planting. Avoid high nitrogen fertilisers as this will encourage excess leaf production at the expense of fruit. Good drainage is essential, so if you have heavy, clay soil, build up soil in mounds to improve drainage or plant on a slope where water will drain away easily in wet weather. Figs enjoy a Mediterranean climate with hot, dry summers and cool, wet winters, so don’t overwater during the summer. Excessively wet weather or overwatering during fruit set can cause the fruit to split. They can also be sensitive to frost when young, so be prepared to protect them with a towel or shade cloth if necessary, for their first 1–3 winters. Once established, they can tolerate quite heavy frosts. Most fig trees produce two crops annually. The first crop is known as the Breba crop and usually has larger fruit but a smaller yield. The second crop is called the Higos crop and is considered the main crop for the year. Figs are very perishable and fresh fruit are best eaten within days of picking for best quality. (Drying is an efficient way of storing them but it is said that about 40% of C and B group vitamins are lost in this process.) Figs are ready to harvest when they droop a little rather than standing erect on their stems and should feel soft when given a gentle squeeze. The fruit may split slightly and the ‘eye’ at the base of the fruit may form a small opening and ooze a sweet syrup. 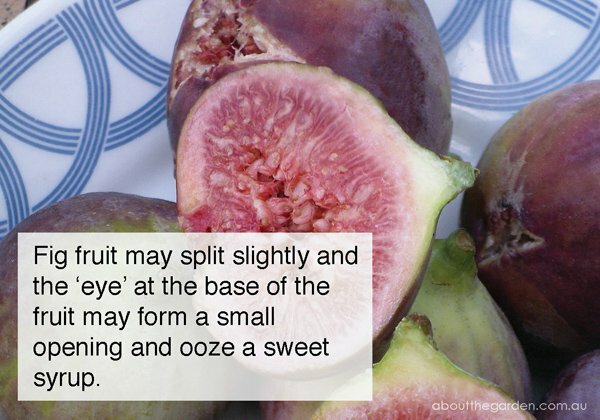 Hold the fig from the stem and twist-pull gently to remove it. Ripe fruit can be stored in the fridge for several days, but don’t wash it until it is ready to be eaten. Figs can be harvested when almost ripe, and allowed to ripen at room temperature indoors. Judicious pruning can encourage a more compact and productive tree. A newly-planted tree with a single stem should be pruned 60cm from the ground to encourage branching out, then three of the resulting stems should be selected to form the main framework. Fruit are born on the axils of leaves on the current season’s wood. Encourage vigorous fruiting by cutting back each season’s growth by about one third each winter. Fig trees are easy to propagate from cuttings, which can be taken in winter during your annual prune. Cuttings can be wrapped in newspaper and stored in the refrigerator for several weeks to keep them fresh. 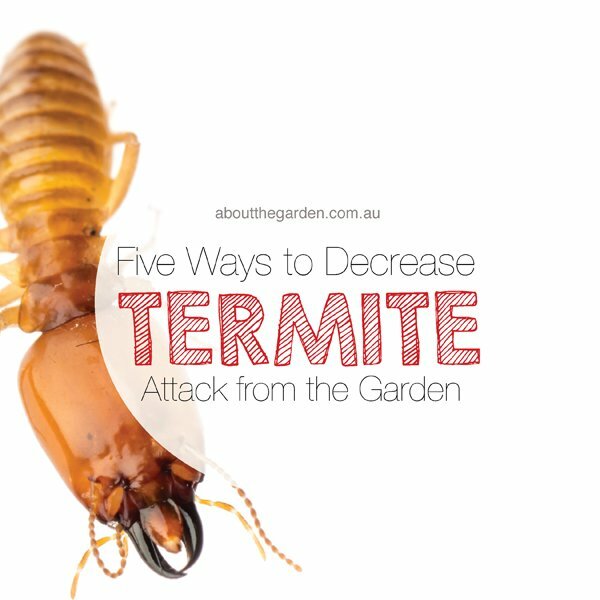 This can also help ‘overwinter’ them if you live in a tropical or subtropical climate. If you have more than one type of tree, make sure you label them with their variety. Plant them in pots of Searles Fruit & Citrus Specialty Mix (make sure you plant them the right way up) and repot the plants as they grow. Fig trees grown from cuttings don’t take long to start fruiting and make great Mother’s Day presents! Figs are affected by few pests and diseases if given a warm, sunny position and well drained soil. If figs are affected by fruit fly, erect Searles Fruit Fly Traps to curtail these pests. Leaf-eating beetles can be controlled with Searles Bug Beater. Fig trees have three different genders and can only be pollinated by a type of tiny wasp. Male trees (caprifigs) bear woody, inedible fruit; female trees need a suitable male tree nearby to pollinate them before they can bear fruit (these trees bear fruit with fertile seeds); infertile trees don’t need a pollinator and bear infertile, unseeded fruit. The fig trees typically available in garden centres are of the third, infertile variety. Popular fig varieties are: Black Genoa, Brown Turkey, Adriatic Fig and Preston Prolific. Fig trees can perform better (with more fruit and less rampant growth) if their roots are restricted, such as when they are grown in a large pot. Submerge the pot in the soil to keep the roots cool and reduce the need for watering. Once a year, lift the pot out of the ground and trim any roots that have outgrown the pot. What we call the fig tree’s ‘fruit’ is actually a structure called a synconium. It is not a fruit in the botanical sense, but a cluster of inverted flowers contained within a fleshy stem! Figs are high in natural sugars, minerals and fibre. 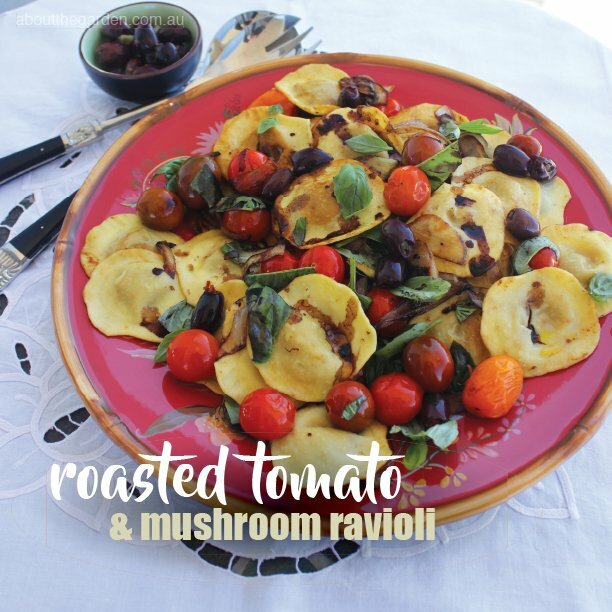 They also contain good levels of potassium, calcium, magnesium, iron, copper and manganese. Dried figs contain an impressive 250mg of calcium per 100g, compared to whole milk with only 118mg. Hi I’m needing help I’ve planted 2 black genoas fig trees 5mths ago they both appear to need flourishing however the leaves when nearly full grown are curling up and going black. I continue to get new growth but I’m unsure what I’m doing wrong . I live in qld and there in a well drained sunny spot out of wind. To follow up with what Chelsea has suggested, my dad used Searles 5IN1 Pellets around his fig tree this year for the first time and had a bumper crop. 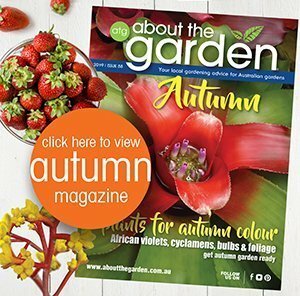 Hope this is helpful, if you still run into issues, don’t hesitate to message again or pop in to visit one of our local garden experts for some advice.